Traipse anywhere in Lyon, France’s third largest city, and you’ll likely pass through a traboule – an ancient covered passageway, used by silk makers to transport their hand-woven textiles. Hundreds of these evocative tunnels snake through the city, which sits at the confluence of the rivers Rhone and Saone. They serve as a reminder of the era when Lyon reigned as France’s silk-making hotbed, their architectural legacy melding with Roman ruins, Baroque squares and well-worn, labyrinthine Medieval alleyways. But just as the centuries-old silk-weaving industry impacted the unique appearance of Lyon, the silk artisans themselves triggered the city’s unparalleled food culture. Working as many as 18 hours a day, the craftsmen flooded unpretentious, family-style pubs for sustenance. By the 19th-century, the taverns, today called bouchons, were helmed by the former, female domestic kitchen staff of prominent bourgeois families. Let go when their employers hit hard times, the cooks, known collectively as the “mothers of Lyon,” gruffly served the silk weavers well-prepared menus of the highest standards, sure to nurture them through their arduous toil. Not accustomed to wasting any food, the “mothers” managed to use the whole animal, specialising then (as they do today) in offal. From chicken livers to tripe, blood sausage to kidneys, the menus now centre on meat in present times, but also utilise abundant cream and pastry in preparation. Quenelles, for example, a cloud-like dumpling made from eggs, cream, flour and nearly indiscernible pieces of flaky trout, manifest the alchemy that continues to occur inside the bouchon kitchen. Back in the day, house-made charcuterie comprised in-between-meal snacks, (called machon) – plates of succulent picnic cuts, which continue to draw peckish locals through the day. Many wash these nibbles down with a fruity beaujolais, crafted from grapes grown minutes away. Today, the mothers have been replaced now by chefs of both genders. But they emerged as a strong feminine force in the 18th-century, growing to the apex of their prominence between the wars, when glitterati noshed side-by-side with silk trade labourers.Perhaps two “mothers” stand out most of all for their contributions. Mère Fillioux brought the denizens for her speciality: Lyon truffled hen. And, feisty Mère Eugénie Brazier became the first woman to earn three Michelin stars. Brazier also gets credit for training a dextrous fellow who would eventually outshine her to become the world’s first celebrity chef – Paul Bocuse. 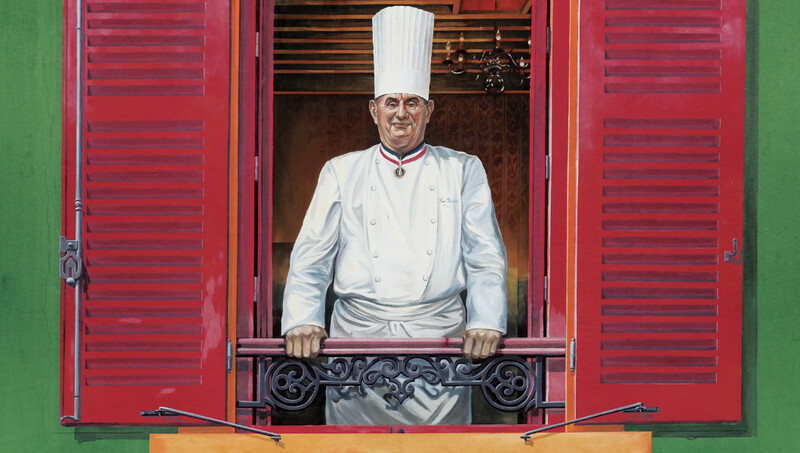 Ninety years old, Paul Bocuse relishes his role as Lyon’s culinary son. His principle restaurant L’Auberge du Pont de Collonges, boasting three Michelin stars, serves his seminal brand of nouvelle cuisine 365 days a year. It lies riverside, just a few kilometres north of town in a green house, bedecked with pink shutters and sporting Bocuse’s signature rooster emblem on an exterior wall. The extensive menu holds a number of classics – such as an earthy, foie-gras intoned truffle soup, the favourite of a bevy of presidents and movie stars. 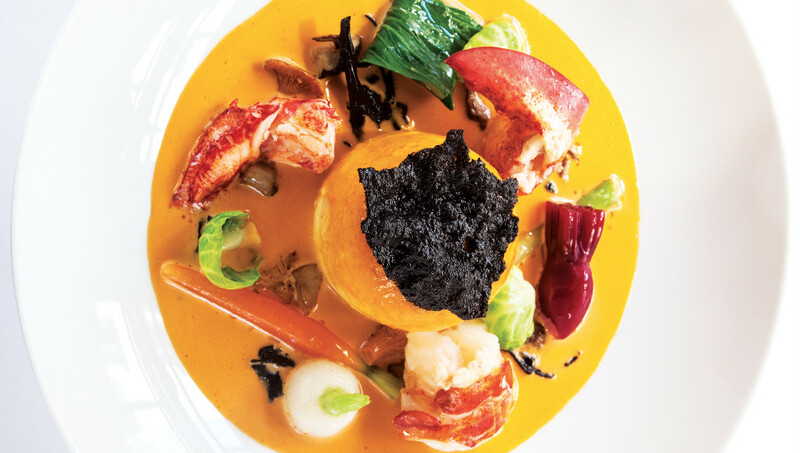 Credited with lightening up classic French gastronomy, Bocuse modernised local cuisine by bringing more fresh ingredients to play – though his creations portray a signature, rich elegance. Keeping history alive, the defied chef draws from the past, but also never tires of innovating. He’s treated like royalty in Lyon, and serves as a mentor for nearly every new restaurant that opens in town. Visitors can sample Bocuse’s cuisine at four bistros, see his influence at the town market (named for him) and discover his secrets at his prestigious Institut Paul Bocuse, a serious school for chefs. On any gourmand’s bucket list, this retrofitted rural inn sits a few kilometres north of town. Once operated by the Bocuse family, young Monsieur Bocuse (as locals call him) took over the inn and eatery after training with Mère Brazier – and the rest is history. The oldest three Michelin-starred restaurant in the world, L’Auberge du Pont, also known simply as Paul Bocuse, remains an obligatory stop for anyone who worships at the culinary altar. Timeless, even slightly kitschy, with copper pots, baskets and brightly painted walls, the ambiance references the hospitality of a grandmother’s country kitchen. Yet stellar service, crisp linens and multi-courses of tantalising creations, from pigeon in puff pastry to crevettes with celery mousse, assure eaters that this meal won’t soon be forgotten. Order à la carte or opt for one of three tasting menus which pose decade-old favourites at 160, 210 or 250 Euros. When chef Mathieu Viannay bought La Mère Brazier in 2008, he vowed to celebrate the legacy of Eugénie Brazier, who opened her bouchon here in 1921. During the last eight years, with the prize of two Michelin stars to affirm his efforts, Viannay honours the soul of one of Lyon’s most defining restaurants. Letting the decor reference the past, dabbling with Mère Brazier’s original recipes, the creative chef also turns out innovative twists on traditional dishes – all based on the freshest market finds. Whether a tender sea bass with creamy mousseline sauce, a classic Bresse duck with umami evoking black truffles tucked beneath its skin or red mullet accompanied with eggplant and stuffed zucchini flower, then brightened with Esplette chilli butter sauce, Viannay makes a mark. Wedged on a side street in the centre of Lyon near City Hall, this Lilliputian bouchon would rather you speak French. But, that makes a meal here all the more authentic. Friendly wait people seat you at red-and-white checkered cloth-clad tables, pour you a red wine Kir cocktail, and let you muse over the menu. Artefacts and vintage posters hang askew on wood-flanked walls, and you can almost hear the chatter from bygone years. Infinitely affordable three-course menus, especially at lunch, deliver sumptuous dishes such as poached eggs in red-wine sauce, lentil salad, coq au vin, quenelle with crayfish, and chittering sausages. Picture-perfect sweets and moan-worthy local cheese end the meals, which run 19 to 27 Euros per person. Like eye candy, this tiny, cluttered eatery looks the part. With room for just 25 diners, it feels cramped, but affable. A tile floor holds well-used dining tables and standing wine barrels, stacked with vintage wine. Hanging pots, photographs, baskets and other artefacts mark the walls. Enter to hear a buzz of conversation, followed by deafening silence as diners dig into overflowing plates, crowded with immense portions. Nibble veal kidney with mustard sauce or a salad of pressed-calf’s muzzle. Platters of sausages edged with lentils, cold chicken-liver salad and the best apple tart in town seals the deal. Find it nestled in the heart of town, filled with locals and lovingly supervised by its cheek-kissing and hand-shaking, over-sized chef.